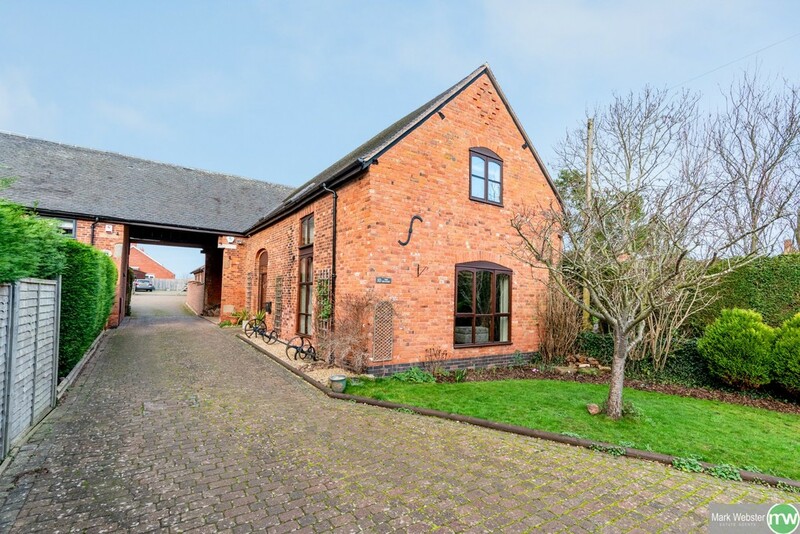 Warton Lane, Austrey - Mark Webster & Co.
MARK WEBSTER estate agents are delighted to be able to offer for sale this truly remarkable and much improved 4 bedroom barn conversion located in the picturesque village of Austrey. 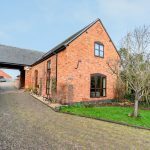 The property offers an extensive range of good sized accommodation spread over two floors and benefits from some beautiful features to include exposed brickwork, vaulted ceilings and exposed beams. The property is a credit to the current owners and is beautifully presented throughout and has been much improved with a newly fitted central heating boiler, a refitted kitchen (approx 2 years ago) and Sapele hard wood windows and doors. We consider internal viewing to be essential to appreciate this beautiful home. IMPRESSIVE RECEPTION ROOM/FORMAL DINING AREA 19' 1" x 13' 3" (5.82m x 4.04m) Having a double glazed side entrance door with adjoining double glazed side screens, engineered oak flooring, two double panelled radiators and doors giving access to the lounge and inner hallway. LOUNGE 18' 2" x 18' 7" (5.54m x 5.66m) A very large space with the main feature being the centre bricked fireplace with decorative beam and having an inset cast iron log burning stove, two double panelled radiators, double glazed windows to front and side aspects. GUEST WC 5' 7" x 4' 5" (1.7m x 1.35m) Low level WC, pedestal wash hand basin, tiled splash back area, single panelled radiator and an extractor fan. REFITTED KITCHEN/DINER 18' 4" x 9' 4" (5.59m x 2.84m) Having a beautiful travertine tiled floor with under floor heating, recessed LED ceiling down lighters, double glazed French doors leading out to the rear garden, extensive range of fitted base and eye level units, decorative cornice and pelmet, space and point for a Range style gas cooker with extractor hood above, black sparkle effect square edge work surfaces, recessed ceramic sink with a chrome effect mixer tap over, built in fridge and dishwasher. UTILITY ROOM 4' 8" x 4' 4" (1.42m x 1.32m) Housing the wall mounted Vaillant central heating boiler, roll edge work surface area, plumbing for a washing machine, further appliance space and engineered oak flooring. MASTER BEDROOM 13' 1" x 16' 2" to the fitted wardrobes (3.99m x 4.93m) An impressive master suite that benefits from full length fitted wardrobes providing ample storage, vaulted ceiling, double glazed window to front aspect, double panelled radiator and door to the en-suite. ENSUITE 9' 6" x 6' 1" (2.9m x 1.85m) Having a double glazed Velux window to side aspect, chrome towel radiator, low level WC, his and hers wash basins, good sized fully tiled shower cubicle having a chrome mixer style shower, tiling to splash back areas. BEDROOM TWO 19' 1" x 9' 6" maximum (5.82m x 2.9m) Double glazed Velux window to side aspect, laminated wooden effect flooring and a single panelled radiator. BEDROOM THREE 11' 8" x 9' 4" (3.56m x 2.84m) Double glazed Velux window to side aspect and a single panelled radiator. BEDROOM FOUR 9' 7" x 9' 4" (2.92m x 2.84m) Double glazed Velux window to side aspect and a double panelled radiator. FAMILY BATHROOM 11' 6" x 6' 2" (3.51m x 1.88m) Double glazed Velux window to side aspect, single panelled radiator, door to the airing cupboard, low level WC, wash basin, fitted base level vanity storage units, panelled bath with an electric shower over, tiled splash backs and tiled floor. STUDY AREA 13' 0" x 13' 3" maximum due to the area narrows (3.96m x 4.04m) A flexible space that is currently used as an office having a double glazed window to rear aspect and a stunning vaulted ceiling. TO THE EXTERIOR The front garden is mainly laid to lawn. The rear garden is fully enclosed by recently built bricked walls with decorative coping stone tops being mainly laid to lawn with barked and planted borders. There is a rear block paved driveway providing off road parking and also access to the garage. GARAGE 18' 4" x 9' 4" (5.59m x 2.84m) Having double opening doors, useful roof storage space, power and light. FIXTURES & FITTINGS: Some items may be available subject to separate negotiation. SERVICES: We understand that all mains services are connected. TENURE: We have been informed by the Vendor that the property is FREEHOLD, however we would advise any potential purchaser to verify this through their own Solicitor. DISCLAIMER: DETAILS HAVE NOT BEEN VERIFIED BY THE OWNERS OF THE PROPERTY AND THEREFORE MAY BE SUBJECT TO CHANGE AND ANY PROSPECTIVE PURCHASER SHOULD VERIFY THESE FACTS BEFORE PROCEEDING FURTHER.